Big number chart magnetic poster makes counting fun. Learning to count and sequence numbers, count b..
Red - Green Ten-Frames are great learning aids. We use 2 sided magnet - red one side/yellow on the o..
Red - Yellow Ten-Frames are great learning aids. We use 2 sided magnet - red one side/yellow on the ..
Our huge photo-realistic printed magnetic coins make learning to count and work with money fun! 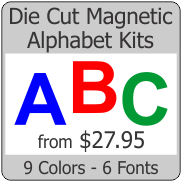 Grea..
Our huge printed ABC magnets make learning fun! 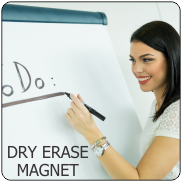 Great for use with magnetic whiteboards. Big 3 inch .. Create seat assignments, reward charts and more using our colorful robot name badge magnets. Reusabl.. Heavy Duty Exterior Grade Vinyl 0.030 inch Car Magnet Material professionally printed and cut t..